Thematic research group: Dr Jeffrey is a member of the Infrastructural Geographies group. Political and legal geographer interested in state-building after conflict, particularly within the former Yugoslavia. His research has sought to contribute to debates concerning critical geopolitics, civil society and transitional justice. Geographies of state formation. This research has explored the role of non-governmental organisations (NGOs) in fostering democratic participation after violent conflict. Over several periods of residential fieldwork in Bosnia and Herzegovina Alex has sought to investigate how donors, new state institutions and intervening agencies shape the agendas of NGOs. This work has been funded by an ESRC Studentship (R42200134266), an ESRC Postdoctoral Fellowship (PTA-026-27-0576) and internal funding from Newcastle University. Key outputs include papers in Political Geography (2006) and Development and Change (2007) and a research monograph entitled The Improvised State: Sovereignty, Performance and Agency in Dayton Bosnia (2013, Wiley-Blackwell, Oxford). Legal Geopolitics. Focusing specifically on the experience of Bosnia and Herzegovina, this strand of research has explored the process of establishing a domestic War Crimes Chamber with jurisdiction to investigate and prosecute crimes undertaken during the 1992-5 war. Key publications exploring this area of work include papers in Environment and Planning D: Society and Space (2009), Transactions of the Institute of British Geographers (2011), Annals of the Association of American Geographers (2014), Political Geography (2015), Space and Polity (2017) and Progress in Human Geography (2018). Between 2011-13, Alex was Principal Investigator on a two-year ESRC First Grant (RES-061-25-0479, FEC £267 248) entitled Localising International Law exploring how the War Crimes Chamber in Sarajevo has communicated with victim populations. Citizenship in Divided Societies. This strand of research seeks to explore how ideas of citizenship are negotiated, contested and learnt following periods of political instability. Between 2012-2017 Alex was an Academic Fellow on a European Research Council Advanced Grant entitled Youth Experiences of Citizenship in Divided Societies: Between Cosmopolitanism, Nation, and Civil Society" (Principal Investigator Professor Lynn Staeheli, FEC €2.5M) and has co-authored work in edited book collections and Political Geography (2017). Alex Jeffrey is interested in hearing from scholars who wish to conduct masters, doctoral or post-doctoral work on state formation, geographies of law and justice, the role of non-governmental organisations after conflict and state/society relations both within and beyond the states of the former Yugoslavia. Jeffrey, A. 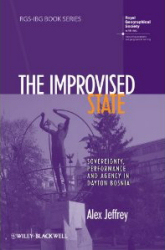 (2013) The Improvised State: Sovereignty, Performance and Agency in Dayton Bosnia. Oxford: Royal Geographical Society Book Series Wiley-Blackwell. Nayak, A. and Jeffrey, A. 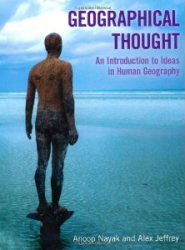 (2011) An Introduction to Geographical Thought. Harlow: Pearson. Jeffrey, A. (In Press) "Adjudicating Sovereignty: From State Weakness to Improvisation." In: Heathershaw, J. and Schaltz, E. (Eds.) Logic of Weak States in Eurasia. Jeffrey, A. (In Press) "The State." In: Agnew, J., Mamadouh, V., Secor A., and Sharp, J. (Eds.) 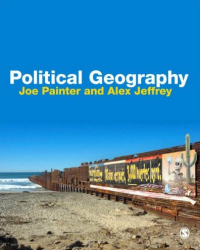 The Wiley-Blackwell Companion to Political Geography (2nd Edition). New York: Wiley-Blackwell. Jeffrey, A. and L. Staeheli (In Press) "Learning Citizenship: Civility, Civil Society and the Possibilities of Citizenship" In: Kallio, K. and Mills, S. (Eds.) Geography of Children and Young People Vol. 7. New York: Springer. Jeffrey, A. (In Press) "Idealism" In: Kobayashi, A. et al (Eds.) The International Encyclopedia of Geography, Oxford: Wiley-Blackwell. Coe, N., Dittmer, J., Gill, N., Secor, A., Staeheli, L., Toal, G. (Ó Tuathail, G.) and Jeffrey, A. (2014) "The Improvised State: Sovereignty, Performance and Agency in Dayton Bosnia, Alex Jeffrey Review Forum" Political Geography 39: 26-35. Jeffrey, A. (2013) "Geography of Justice." In: Warf, B. Oxford Bibliographies in Geography. New York: Oxford University Press. Williams, A. J, Jeffrey, A., McConnell, F., Megoran, N., Askins, K. Gill, N. Nash, C., Pande R. (2013) "Interventions in teaching political geography: Reflections on practice" Political Geography 34(2) 24-34. Bolton, M., Froese, S., and Jeffrey, A. (2013) "This space is occupied! : The politics of Occupy Wall Street's expeditionary architecture and de-gentrifying urbanism." In: Welty, E., Bolton, M., Nayak, M., and Malone, C. eds. Occupying Political Science: The Occupy Wall Street Movement from New York to the World New York: Palgrave Macmillan. Jeffrey, A. (2013) "Non-Governmental Organisations." In: Dodds, K., Kuus, M. and Sharp, J. eds. Ashgate Companion to Critical Geopolitics. Aldershot: Ashgate. pp. 387-404. Jeffrey, A. (2012) "The politics of 'democratization': Lessons from Bosnia and Iraq." In: Grugel, J. Democratization Sage Library of Political Science. London: Sage. Jeffrey A. (2011) "The political geographies of transitional justice." Transactions of The Institute of British Geographers 36(3) 344-359. Jeffrey A. (2011) "The masks of Europe in contemporary Bosnia and Herzegovina." In: Bialasiewicz, L. ed. Europe in the World: EU Geopolitics and the Making of European Space. Aldershot: Ashgate. Jeffrey A. (2011) "Civil Society and Transitional Justice in Bosnia and Herzegovina." In: Simko, D. and Mader, U. eds. Stabilization and Progress in the Western Balkans. Bern: Peter Lang. pp.163-180. Jeffrey, A. (2009) "Justice incomplete: Radovan Karadžic, the ICTY and the spaces of international law." Environment and Planning D: Society and Space 27(3) 387-402. Jeffrey, A. (2009) "Containers of fate: problematic states and paradoxical sovereignty." In: Dodds, K. and Ingram, A. eds. Spaces of Security and Insecurity: Geographies of the War on Terror. Aldershot: Ashgate. pp. 43-64. Jeffrey, A. (2008) "Zilho's Journeys: displacement and return in post-conflict Bosnia." In: Jeffrey, C. and Dyson, J. eds. Telling Young Lives. Temple University Press: Philadelphia. pp. 113- 122. Jeffrey, A., McFarlane, C.. and Vasudevan, A. (2008) "Guest Editors' Introduction: Debating Capital, Spectacle and Modernity." Public Culture 20(3) 531-538. Bolton, M. and Jeffrey, A. (2008) "The politics of NGO registration in international protectorates: The cases of Bosnia and Iraq." Disasters 32(4) 586-608. Vasudevan, A, McFarlane, C. and Jeffrey, A. (2008) "Spaces of Enclosure." Geoforum 39(5) 1641-1646. Jeffrey, A. (2008) "Adjudications of civility: gentrifying civil society." Geopolitics 13(4) 740-744. Jeffrey, A. (2008) "Contesting Europe: the politics of Bosnian integration into European structures." Environment and Planning D: Society and Space 26(3) 428-443. Bialasiewicz, L., Campbell, D., Elden, S., Graham, S., Jeffrey, A. and Williams, A. (2007) "Performing security: The imaginative geographies of current US strategy." Political Geography 26(3) 405-422. Jeffrey, A. (2007) "The politics of 'democratization': Lessons from Bosnia and Iraq." Review of International Political Economy 14(3) 444-466. Jeffrey, A. (2007) "The geopolitical framing of localized struggles: NGOs in Bosnia and Herzegovina." Development and Change 38(2) 251-274. Jeffrey, A, McFarlane, C. and Vasudevan, A. (2007) "Spectacle, state, modernity." Geopolitics 22(1) 202-225. Jeffrey, A. (2006) "Building state capacity in post-conflict Bosnia and Herzegovina: the case of Brčko District." Political Geography 25(2) 203-227. Jeffrey, A. (2006) "Writing terriorial conflict" Review of International Political Economy 13(5) 830-845.